In this week’s blog, I write about Economic Statistics, the CIPFA conference, the Local Government Association and European Union funding, Grenfell Tower, Business Planning, Supported Housing, the Scottish Planning Bill, Social Rents in Wales, Housing in the Isle of Man, Welfare Reform and Local Authority Housing Finance. Some interesting economic statistics were published recently. United Kingdom government debt now stands at £1.88trillion (equivalent to 89% of Gross Domestic Product) and it is still increasing. Interest on this debt now costs about £50billion a year and that will also increase – quite significantly if interest rates are increased to reduce inflation and / or protect the value of sterling. Public expenditure is now at 42% of Gross Domestic Product compared with 40% before the financial crisis of 2008. 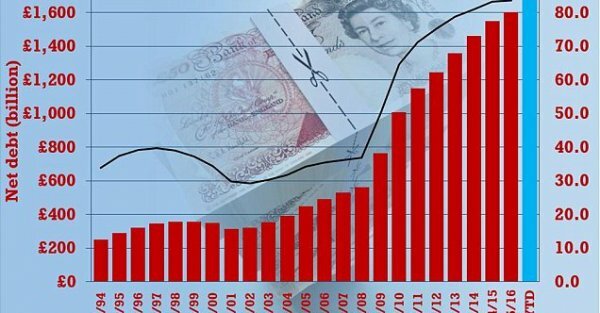 This means that, in practice ‘austerity’ has not meant reducing public expenditure in total but has meant making reductions in budgets for services such as local government, housing and the police; and making reductions in welfare entitlements; while increasing expenditure elsewhere and paying for it through increased borrowing! If I was Chancellor of the Exchequer, I would take a different approach but unfortunately (or perhaps fortunately) I am not! The graph below shows how UK Government debt increased from 1993/94 to 2015/16. Since 2015/16 it has increased by another £300billion! Despite the UK Government’s assurances that everyone will be able to have everything they want after ‘Brexit’ I fear that the economic situation and continued ‘austerity’ will lead to Councillor Bentley being disappointed. I would expect central government funding for economic development to be minimal after ‘Brexit’ and that this will be one of the many ‘significant financial shocks’ to which Andrew Burns refers.